Santa Cruz to Monterey/Pacific Grove should be a lovely day on the bike. That is, unless there’s a raging headwind and your normal power pedaler is hitting day 10 with puffy, sore knees. When mapping a daily route via Google Maps, it generally figures 10mph average pace to allow for stops, traffic and the like. We’re normally right on that. However today was closer to 10mph *moving* with actual average speed for the day more like 7. If you can get past the wind, speed, and pain, it really was a lovely day. 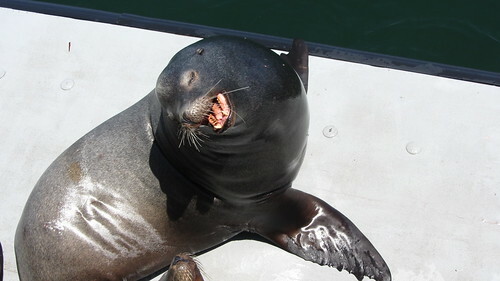 The sun was out, the views, view-worthy, and the animals (otters, seals and a pelican or two) in abundance. It was just that damn wind and the sore knees that pushed us close to a family breakdown. 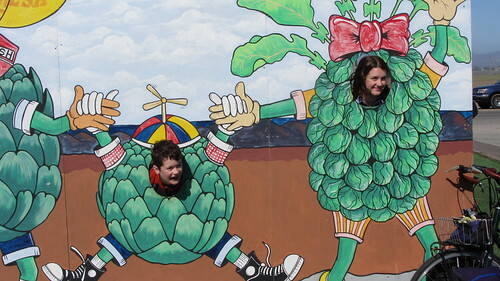 But the kids’ spirit and desire to get to San Diego kept us moving forward. The saving grace: we were staying with friends and didn’t have to deal with camping or squeezing the last dollar out of a Priceline hotel bid. 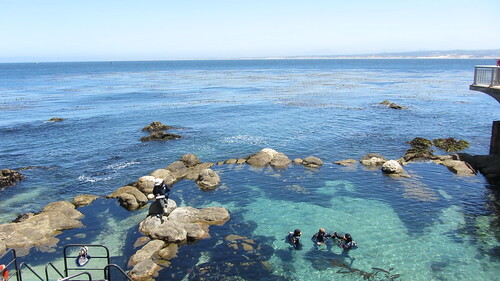 So when we arrived in Monterey, we could focus on eating, drinking and being social. Which pointed me in the direction of a dry, local rosé. A couple-3 of glasses of that, plus a handful of ibuprofen, and the knees were forgotten for the evening. Toward the end of the ride we were looking for any opportunity to stop for a break. The sign advertising 10 for $1 avocados and limes and kiwi as enough to draw us in. Even though the avocados were tiny and not at all ripe, we picked up 10 and figured they’d be ready to eat by the time we got to Big Sur. We made more stops to rest, look at the views and peer through binoculars looking for marine life. We were rewarded with pelican, sea otters and seal sightings! 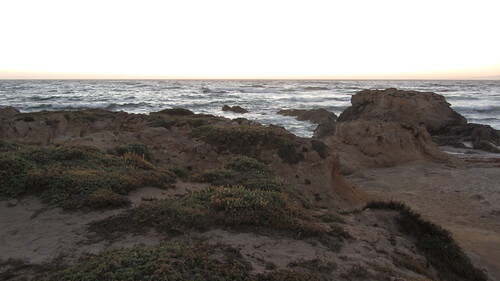 We eventually made it to Pacific Grove and were greeted with beers, dinner and good company. Ahhh! So happy to arrive! High: 10 for $1 limes & avocados at Watsonville fruit stand. And our lovely stay with friends. Low: Tim’s f*cking knees. And the wind. Sleep: Our gracious friends housed us, fed us, and treated us like royalty. In addition to housing us and feeding us, our hosts also graciously offered us the use of their Monterey Bay Aquarium guest passes for all four of us. This stay just keeps getting better! 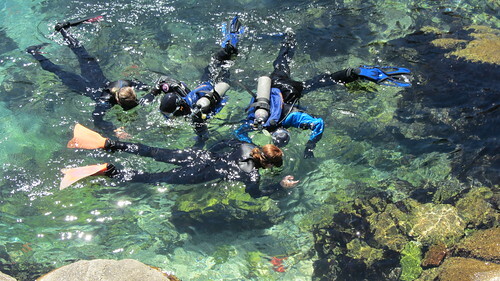 Our friends also recommended that the kids try the Underwater Explorer experience, a two-hour introduction to diving for kids in the aquariums protected tide pool. Wow! What an experience. The kids absolutely loved it. The ratio of instructors to kids was close to 1:1. They both loved it and can’t wait to try real diving some day. 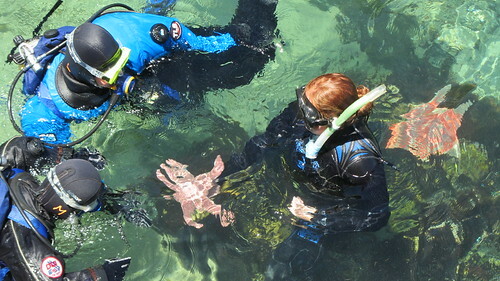 They saw so many creatures including various sea stars, monkey faced eels, sea cucumbers, brown kelp, green kelp and red kelp and so much more. We spent the entire day at the aquarium, taking in all of the exhibits. 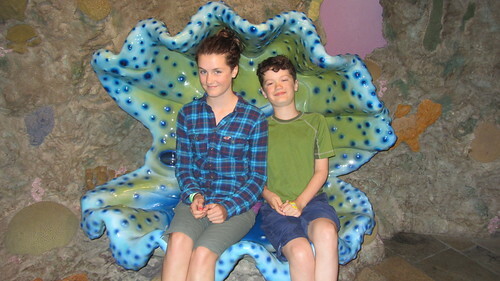 We even found the shell sculpture our daughter had played in on a previous visit to the aquarium when she was 4. We returned to our friends house and enjoyed a lovely dinner on the patio. After dinner, we walked down to the beach to enjoy the sunset. Beautiful! 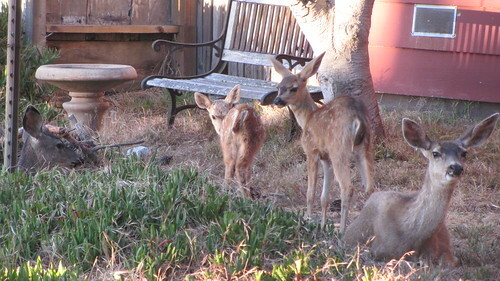 On the way to the beach, we happened upon a family of deer in the neighbors yard. Miles: Absolutely none. Our friend even gave us a ride to and from the aquarium! Low: Tim’s knees still hurting and we’re worried he might not be able to continue to ride. 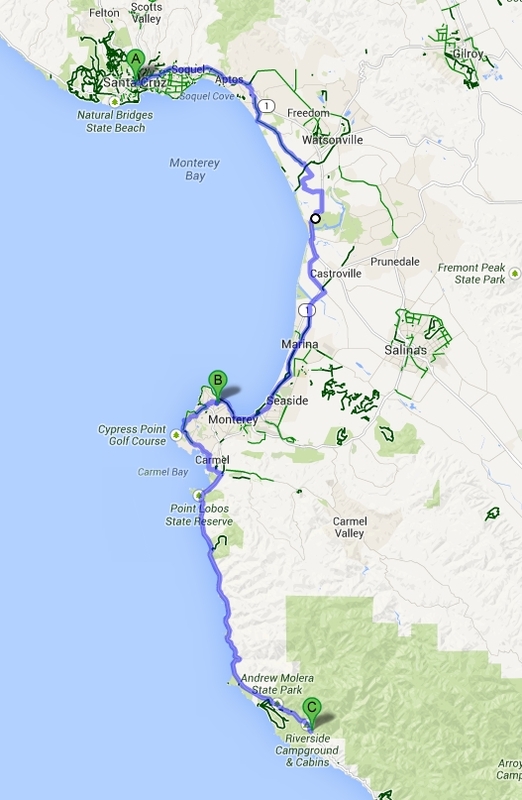 Tim’s sore knees earned us a ride to the Carmel/Hwy 1 interchange, shortening our ride to Big Sur to 26 miles. We figured if we shaved off the first 12 or so uphill miles out of Pacific Grove/Carmel, Tim would have a better chance for some recovery. We’re so thankful for everything they did for us! The rest of the ride to Big Sur was beautiful. We stopped often to rest and take in the amazing views! Tim’s knees were still pretty sore, but he managed to keep pedaling. A steady tailwind helped push us along. And Tim and his stoker took advantage of it to practice their flying skills. They enjoyed those tailwinds for miles! 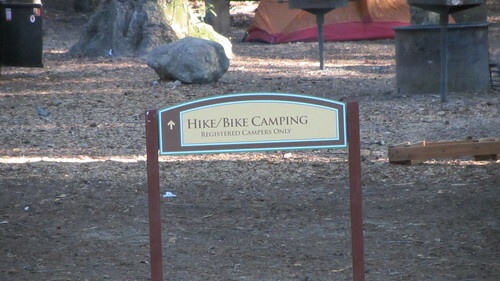 We arrived in Big Sur in the early afternoon and set up camp in the Hike/Bike Camping area, a really nice spot adjacent to the river. This ended up being our favorite camping place of the trip! We met several other bike tourists and a few hikers including a guy from France who was bike touring down the Coast and also had plans to ride across the country. We also met a traveler named Jay Dancing Bear who entertained us with his guitar and flute. He’s been living in the area for decades and gave us lots of advice and tips about the rest of our journey. We ended up staying an extra night in Big Sur since our daughter woke up with a fever in the morning. We really didn’t mind taking a rest day so early in the trip. Tim relished the recovery, we read, relaxed, played in the river and enjoyed camping in a grove of Redwoods. Big Sur is such a gem! After dinner on the second night we played a few rounds of wood chip poker with the kids. They cleaned up! High: Pfeiffer Redwoods State Park is beautiful. Low: Daughter got sick and we ended up staying an extra night. 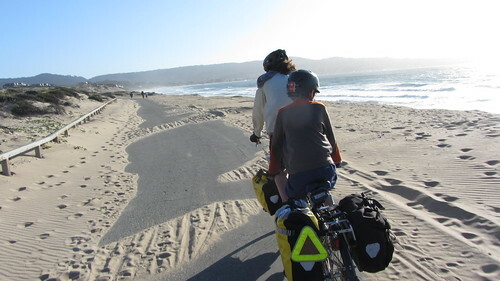 This entry was posted in bikes, Pacific Coast Bike Tour and tagged "family bike tour", bikes, CA, kids, Pacific Coast Bike Tour, tandem. Bookmark the permalink.